Tazzie Quilts: This project has me gripped! This project has me gripped! I'm really gripped by this quilt, as is often the case when things are going well. I'm able to piece away at my machine with little trouble, and so that's what I'm doing - in every moment that I can! Some of the fun in this quilt is choosing the fabrics, and I knew I wanted greens with the florals for the next border. This is my favourite green tone, and I was thrilled that it played nicely with the other fabrics. The photo above is a bit crookedy, sorry about that - and I'm too lazy to fix it! 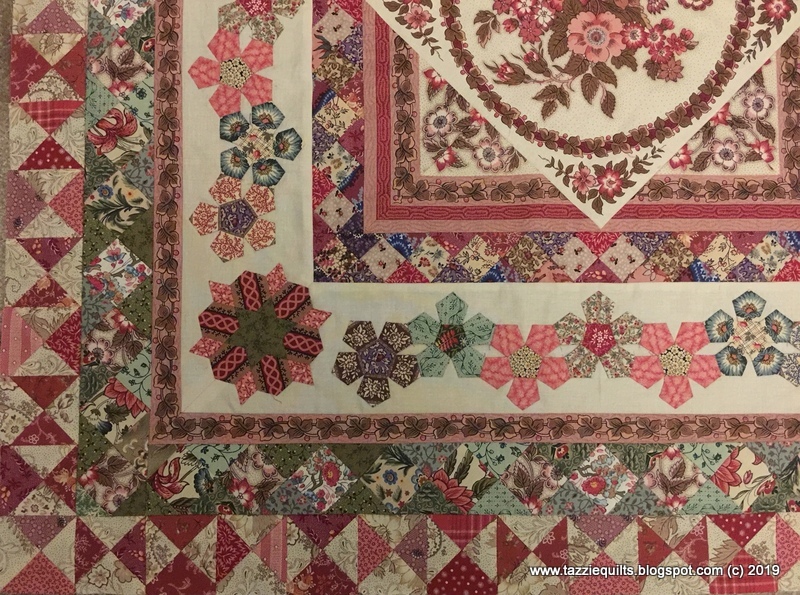 Those two green triangles in the middle - the fabrics I've used in them are from DEEP stash. The bottom one is all gone now, there's not a skerrick left - the top one I stumbled across at the bottom of a green pile while auditioning fabric from my stash. They're both from the Smithsonian Collection which is a line of reproductions from way back when I was very much a beginner quilter. The Smithsonian collections were released in 1995 and 1996 I understand. For my stash, 23-24 years old is practically antique! The print in the top triangle I had in pale blue as well as the green, and the bottom triangle I also had in pale blue and a cream colour. I wonder if there are any shards of those left in my scrap boxes? And this is where I'm at as of last night. I've placed two sides of the hourglass borders. All the hourglass blocks are made for the other sides, I just need to get them into strips and sewn in place. How fun! 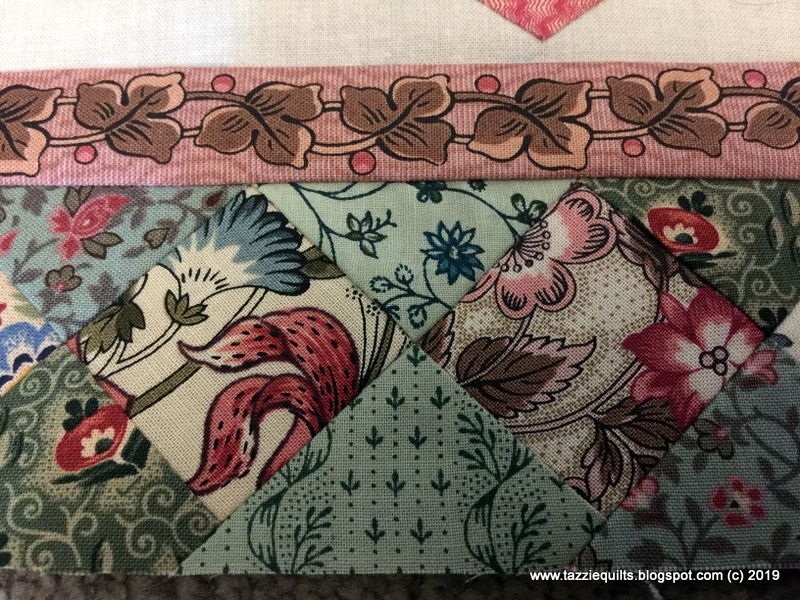 Next is another border using the same shapes as the green border, I just need to decide if I'm going to make it with a different colour theme, or attempt to emulate the green border with a few different fabric additions. Thursday classes begin again tomorrow, and two of the ladies are also working on this project. I'll snap some pictures to share with you so you can see how entirely different our quilts are. 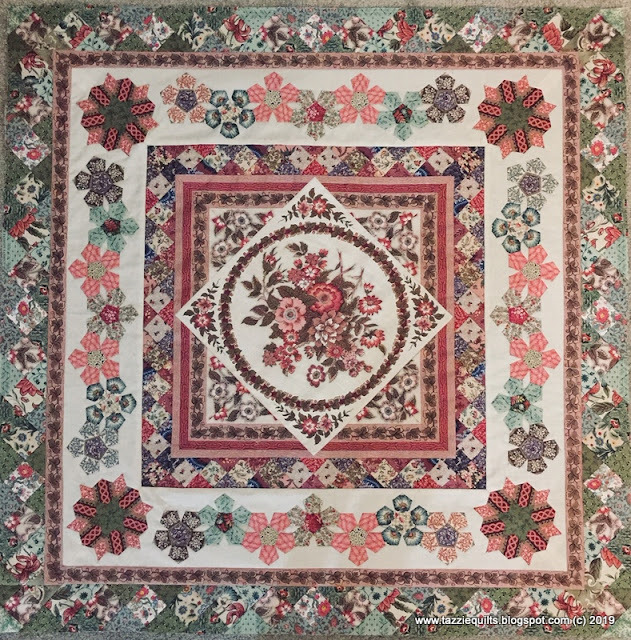 I'm always amazed how quilters can take a pattern and make such different and beautiful pieces of art. I love how this is coming together especially with the softer greens and corals. This is blowing me away, your fabric choices are perfect! I can't imagine the time and patience you have invested in this beautiful quilt. What do you plan on doing with it when you finally finish it? Do you enter your quilts in quilting shows? Very! impressive! Absolutely stunning! Don't you love it when you find just the right piece even if it is 20 years old. And, don't you hate it when you use the last piece of one of your favorites? Now this green will be cherished for years in this fabulous quilt! Beautiful as usual Tazzie. What size pentagon shapes have you used. I am making my sister a quilt from scratch....no pattern, and I thought a row of pentagons would be lovely. Hope you are surviving the heat. I cannot believe how you "grabbed the bull by the horns" and got into this project. It is absolutely gorgeous. Thank you for sharing. Your work is very beautiful and very precise. WOW, this will really be a fantastic quilt. Looking forward to what you do next to it!